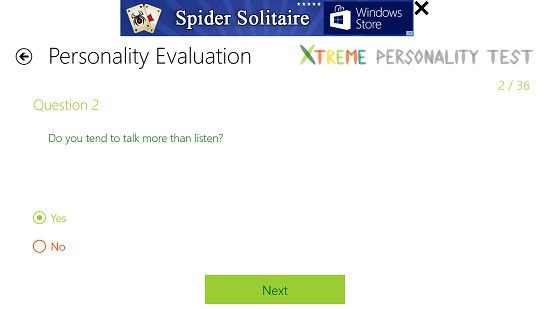 Xtreme Personality Test is a free app for Windows 8 and 8.1 which allows you to test your personality by means of asking you questions regarding the same. The app allows you to answer the questions related to your day to day life, and once you have done that, it assesses and calculates your personality type, immediately displaying it on your screen. 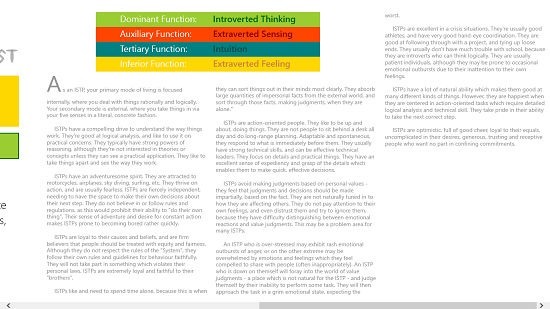 It shows you a brief gist of your personality type, and also allows you to go through the details of your personality type by providing you with a detailed paragraph explaining you your personality. When you open the app, you can choose to change the language of the test, view the various personality types or simply start the test. As always, you can download the app for free from the Windows App Store. 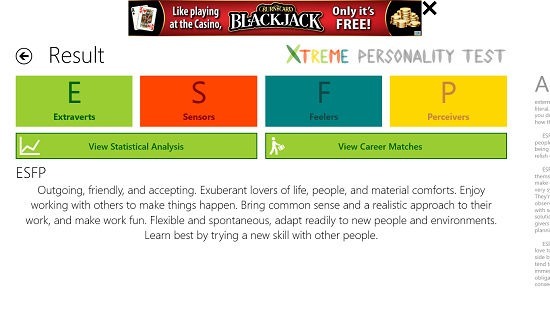 When you run the Xtreme Personality Test app on your screen, be prepared to be presented with the following interface. This is the main menu of the app. From here, you can choose to change language, start the test or view the various personality types. Let’s dive in and test our personality, shall we? When you click on the Start Test button, you will be presented with the above screen. Here, you will be asked a total of 36 questions of multiple choice type. All you have to do is to choose an option from the two options displayed, and click the next button. The app will ask you a total of 36 questions to correctly judge and analyze your personality. 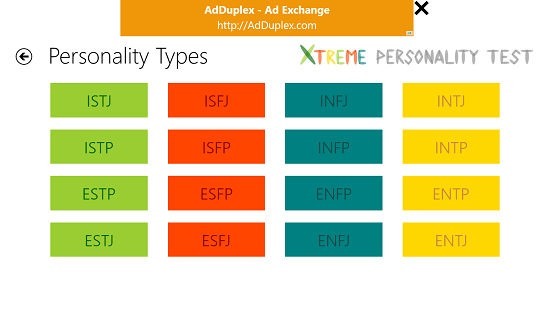 Upon answering all the questions, you will be shown the result of your personality type on your screen, much in the way which is shown in the screenshot that follows. I got the result ESFP for my personality. You can see the details of the result in brief in a paragraph form. If you are unable to understand what this means, you can also feel free to scroll over to the right side of the screen and see the details of your personality evaluation. You can go back to the main menu via the back arrow button. Now, if you choose to view the various personality types all in one place, you can do so by clicking on the button with the same name in the main menu of the app which presents you with the below interface. You can read about the various personalities by clicking on their respective tiles. 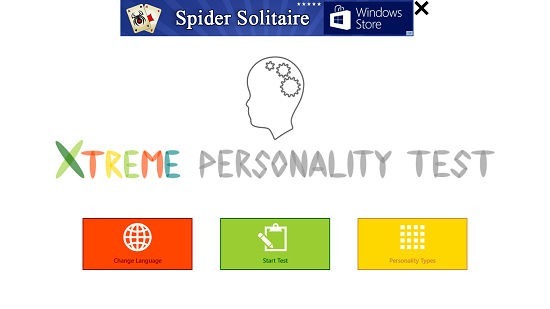 This wraps the main features of the Xtreme Personality Test app for Windows 8 and 8.1. You can also check out the Your Horoscope and Horoscope & Astrology apps for Windows 8 and 8.1. Xtreme Personality Test app offers a great way to assess your personality by means of you answering questions from your day to day life. The app has a nice design UI and makes for a great download! This is worthy of a 5 out of 5 rating!